My whole life, we’ve always had cranberry sauce from the can. You know, that yucky jellied glob? Then, I married The Nerd and we had our first Thanksgiving together. Cranberry Sauce is his favorite thing at Thanksgiving. But his mom made homemade cranberry sauce. I just couldn’t disappoint him. So, I scoured the Internet for an easy recipe for cranberry sauce. And Our Best Bites came to the rescue, yet again. I like that you put all of this in a pan and bake it. You don’t have to worry about burning it on top of the stove or anything. Wash the cranberries and remove any bad ones. Put in a 9 x 13 inch baking dish and add water, orange juice, sugar, cinnamon and cloves. 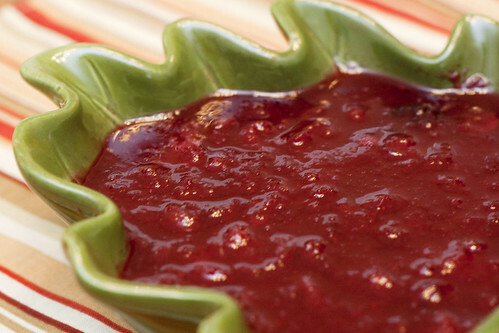 Mash the cranberries for a textured sauce or process with a blender for a smooth sauce. Allow to cool. It will thicken as it cools. I put it in the fridge until it’s time to serve. 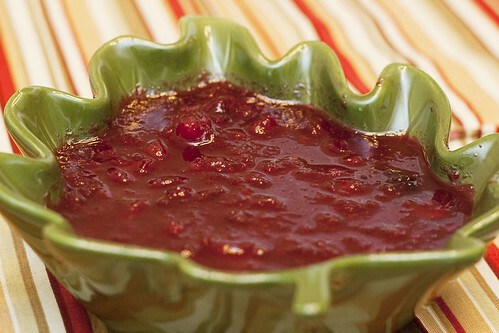 Cranberry Sauce is a holiday dinner essential in our family. This is my favorite recipe for whipping up some the day of the event.